I picked up my packet for this weekend's race on Wednesday morning. 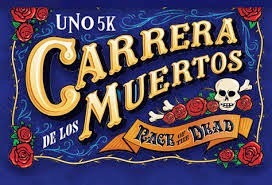 I'll be running the Carrera de los Muertos 5k in Chicago's Pilsen neighborhood on Saturday morning. I'm super excited for this race! A day of the dead 5k with live music that encourages costumes? Sign me up! I've been nursing a pretty terrible cold all week, but I when I woke up yesterday morning, I was feeling pretty good. 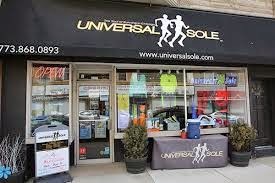 Packet pick up was at Universal Sole, which is almost exactly 5 kilometers from my building. How convenient! I threw on my running gear and hit the road. My plan was to run there, get my race packet, and then walk home, taking care of some errands on the way home. I dressed warmly because it was cold - running tights, a long sleeve running shirt, and I had gloves and a hat packed in my back pack in case I needed them (the back pack is a recent purchase and I'm in love with it - I may have to write a post about it in the future). I started out feeling good. I was running slowly, but everything seemed to be working and I felt like I could keep up the pace for the entire run. By mile one, I was too warm and had to roll my sleeves up. By mile two, I had a side stitch and my lungs were on fire and I had to slow to a walk. I ended up walking for almost half a mile. I reached the store disappointed in myself. I thought I was making progress and getting better. I guess not. I have to admit that I really haven't been running regularly. My runs have been few and far between lately, and it really shows. It is amazing that my running ability declines so quickly. I trying to look ahead and use this as motivation to keep moving forward. November's goal is to start and maintain a regular running schedule. Anyway...once at the store, I grabbed a cup of water from the water table outside the store (I love that this is a normal thing for running stores) and got in line. Packet pick up went really smoothly. The folks working the table knew what they were doing and the line moved very quickly. I must say, I really appreciate a pain free packet pick up. The volunteer helping me confirmed all my info, including shirt size, before giving me my packet, which I also appreciated. No surprises = happy Rebecca. I browsed the offerings in the store, as I was given a coupon while in line. Who doesn't like new clothes? Especially discounted new clothes? Sadly, the store doesn't seem to acknowledge the existence of larger lady runners such as myself. There were plenty of smalls and mediums in the women's clothing, but very few larges and no extra larges. Yes, I may be the largest I have ever been at the moment (something else I want to work on in November), but the fact that they didn't carry my size made me feel a bit unwelcome. Good thing I have at least two other running stores where I know I can find running gear that will fit me. My walk home was cold. My run/walk to the store had kept me warm. Too warm, in all honesty. But the walk home made me wish that I had a jacket with me. I stopped a couple places along the way (the grocery store and drug store) to run some errands and warm up. The cat was not part of the packet. Hannah just thinks that everything brought into the apartment is for her. There was the race shirt, my bib number, some safety pins, a map of the race route and market layout, and a couple of flyers for different businesses. I could have done without the flyers, but I was very happy to have the race map. I know a lot of folks prefer digital versions, but my phone doesn't always like to work, so I love having a printed copy to take with me to look over on my way to the race. The shirt is a long sleeve technical shirt, which should come in handy for the rest of this fall and into the winter. I was hoping for a brighter color, but I still like the design. A lot of folks on Facebook were complaining about the shirt's quality and design, but this is a step up for me when compared to some of the other race shirts I've gotten this year (oversized pink cotton t-shirt, I'm looking at you). I do, however, feel that sizing is off. My women's large is very tight and feels more like a medium or even a small, especially when compared to other running shirts that are the same size. Yes, I've put on some weight in the last few months and all my clothes are fitting a bit tighter, but this shirt is uncomfortably tight. My other women's larges aren't nearly this small. I'm hoping that I can drop a few pounds to wear the shirt, because I do genuinely like the design. Folks who registered early for the race had the opportunity to personalize our bibs with a name of our choosing. On Saturday, I will be La Rebu! My coworkers should enjoy this, as Rebu is my nickname at work. I'm excited for the race on Saturday and looking forward to exploring a neighborhood of Chicago that I'm not terribly familiar with. The race sounds like it will be a lot of fun, and I'm planning on using it to kick off a healthy November full of running and healthy food choices.